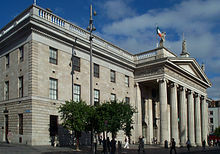 Dublin (/ˈdʌblɪn/; Irish: Baile Átha Cliath [ˈbˠalʲə aːhə ˈclʲiə; ˌbʲlʲaː ˈclʲiə]) is the capital and largest city of Ireland. 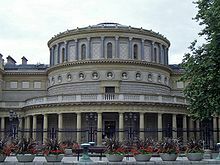 It is on the east coast of Ireland, in the province of Leinster, at the mouth of the River Liffey, and is bordered on the south by the Wicklow Mountains. 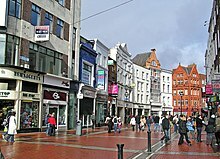 It has an urban area population of 1,173,179, while the population of the Dublin Region (formerly County Dublin), as of 2016[update], was 1,347,359, and the population of the Greater Dublin area was 1,904,806. 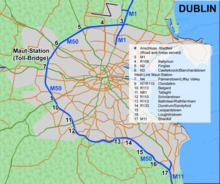 The name Dublin comes from the Irish word Dubhlinn, early Classical Irish Dubhlind/Duibhlind, from dubh ([d̪uβ], [d̪uw], [d̪uː]) meaning "black, dark", and lind ([lʲiɲ(d̪ʲ)]) "pool", referring to a dark tidal pool. This tidal pool was located where the River Poddle entered the Liffey, on the site of the castle gardens at the rear of Dublin Castle. 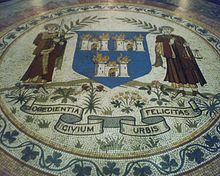 In Modern Irish the name is Duibhlinn, and Irish rhymes from County Dublin show that in Dublin Leinster Irish it was pronounced Duílinn [ˈd̪ˠiːlʲiɲ]. The original pronunciation is preserved in the names for the city in other languages such as Old English Difelin, Old Norse Dyflin, modern Icelandic Dyflinn and modern Manx Divlyn as well as Welsh Dulyn. 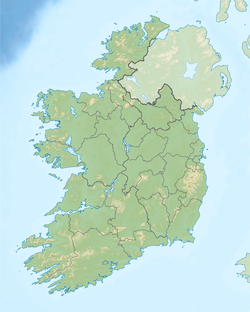 Other localities in Ireland also bear the name Duibhlinn, variously anglicised as Devlin, Divlin and Difflin. 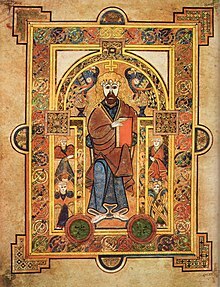 Historically, scribes using the Gaelic script wrote bh with a dot over the b, rendering Duḃlinn or Duiḃlinn. 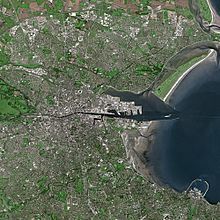 Those without knowledge of Irish omitted the dot, spelling the name as Dublin. Variations on the name are also found in traditionally Gaelic-speaking areas of Scotland (Gàidhealtachd, cognate with Irish Gaeltachta), such as An Linne Dhubh ("the black pool"), which is part of Loch Linnhe. ^ "Population Distribution – CSO – Central Statistics Office". Retrieved 2018-02-04. 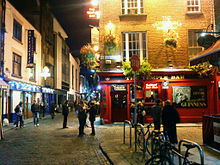 ^ "About Dublin. Economic Activity, Tax & Employment". 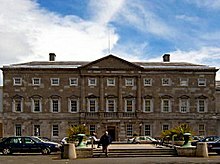 Dublin Chamber. Retrieved 2018-11-12. ^ Melia, Paul (2018-03-22). 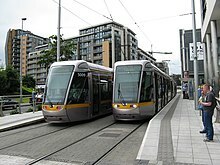 "Revealed: Preferred route for €3bn MetroLink from city centre to Dublin Airport unveiled". Irish Independent. Retrieved 2018-11-12. ^ "2017 Year in Review". Dublin Airport. 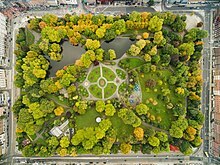 Retrieved 2018-10-03. ^ "Census 2016 -Non-Irish Nationalities Living in Ireland". 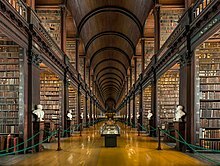 Cso.ie. Retrieved 2018-09-18. ^ "RTÉ Archives | Society | The Italians". 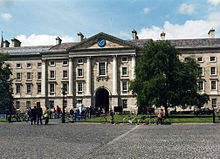 rte.ie. 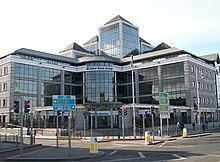 RTÉ. Retrieved 2018-08-14. ^ "Census 2016 Sapmap Area: Settlements Dublin City And Suburbs. Usually resident population by ethnic or cultural background". Central Statistics Office. Retrieved 2018-11-12. ^ "Census 2016 Sapmap Area: Settlements Dublin City And Suburbs. Population by religion". Central Statistics Office. Retrieved 2018-11-12. ^ "College Park to become Lightning home ground". 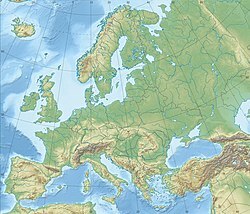 CricketEurope. Retrieved 2019-04-15.